The Jetta leaks coolant fast from behind a pulley loacted just above the oil pan. I can not find any wet spots anywhere around it, but it leaks fast from behind it. The pulley is the largest pulley involved with the serpentine belt. Maybe crank shaft pulley. I dont see coolant in the oil yet, but im sure itll work its way through the oil pan gasket eventually. Probably the water pump here is a guide to help confirm the pump and a step by step guide with diagrams below to show you on your car. through the oil pan gasket. be sure to install a new T-belt & tensioner as well. I dont have the know-how to do this myself. Is it even cost effective to have the water pump and timing belt changed on a 99 Jetta with 180k miles in fair condition? Just to make sure, we are talking about the A4 model VW Jetta, right? best guess at this time is water pump. from behind the big crankshaft pulley when the water pump leaks. Before I go and buy these parts and pay someone to do it. Could it be the crank shaft pulley seal? Or would that be oil leaking out? And yes thats what the car looks like. Sorry about the late reply. Had a phone call. The engine is a 2.0. Ok, il have it verfied first. But I took the undercariage covers off, the oil pan cover, and the engine covers and could not find any wet spots at all. I couldnt even find any moisture on the top side of pulley. depending on engine temperatures & pressure. then as the engine cools, coolant will start to run out. town to the crankshaft sprocket. Diesel engine picture. But your w/p is in the same place. Thanks. 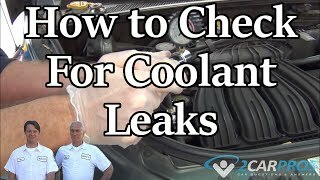 This leak though leaks weather the car is running or not. Its a slow drip with the car off, and a very fast drip with it running. So fast that the coolant resevior will empty out in ten minutes. Regardless, im going to have it diagnosed to know for sure. Yes, have it looked at and post back your finding! It was the water pump leaking. If I could do it myself it woulda cost $170 for water pump, thermostat, and timing stuff. Since I couldn't, $700. Thanks for the help guys. Ima get to posting my next problem with this car. Glad we were able to be of help. Glad it's fixed now. The easiest thing to do is use a coolant pressure tester and pressurize the cooling system. While under pressure coolant or water will leak from the hose or flange. If no leaks found you can buy a head gasket tester kit. But while under pressure just look from where coolant is leaking. I have a 1999 jetta with the vr6 engine. It has about 123,000 miles on the car since purchased from a private dealership. A little after two weeks I my car starts to smoke from inside the engine bay. So I pull off to the side and hear this loud thump as more smoke comes out. My coolant cap had been pushed out because of the pressure I'm guessing. I refill with water and some coolant but still have not done a coolant flush yet. I still get the overflow in coolant expansion tank. What you're describing sounds typical of a leaking cylinder head gasket. Your mechanic can do a chemical test at the radiator to verify that or rule it out. I am interested in purchasing a 1999 volkswagen jetta from a seller on kijiji, but they told me that the car was parked in the garage over the winter and said there was a small amount of coolant on the ground and that they believed it was online a dried or cracked line. I asked them to take a better look at it and they told me they werent able to identify where exactly the leak was coming from but said it hadnt leaked very much over the past week. Could you give me some insight as to what is happening and what my best/worst case scenarios would be?